Hotel 3.14 is a unique designer hotel in the heart of Cannes, just 50 yards from La Croisette. It offers luxury accommodations with a rooftop spa and a panoramic pool. Each floor of the hotel is individually themed to represent one of the 5 continents. The spacious rooms include air conditioning, Wi-Fi access and a plasma screen TV. The hotel’s restaurant, 3.14 Restaurant-Bar, serves gourmet Mediterranean cuisine using organic produce. Hotel 3.14’s panoramic rooftop spa features a hammam, hot tub and offers a range of massage services. The terrace offers access to the panoramic pool with views of the Mediterranean Sea. Hotel 3.14 has its own private beach less than 50 yards from the hotel and the Palais des Festival de Cannes is 330 yards away. The Suite Novotel Cannes is in the center of Cannes, a 5-minute walk from the Cannes Train Station. It offers soundproofed and air-conditioned rooms with flat-screen TVs and free Wi-Fi access. Each room has modern décor. They all come with a sitting area, tea and coffee-making facilities and a private bathroom. All rooms are accessible by an elevator. The Suite Novotel Cannes Centre has a fitness room, and Amma-Assis spa treatments are organized every Thursday. Breakfast can be eaten on the hotel terrace. The bar, open 24/7, offers ready-to-eat meals, and a selection of beverages. La Croisette and Le Palais des Festivals are a 10-minute walk from the hotel. Novotel Cannes Montfleury provides 4-star accommodation a 10 minute walk from Croisette Beach. It is in a residential area and it has 2 restaurants, 2 bars, an outdoor swimming pool and a spa. Cannes Montfleury rooms have private bathrooms and have a balcony with panoramic views. Decorated in neutral colors, each one is serviced by an elevator and offer Wi-Fi internet access. L'Olivier restaurant specializes in regional cuisine while Novotel Café serves French dishes. Blue Lagoon bar serves snacks during the summer and Le Danang bar offers a variety of cocktails. Additional services include a fitness center, a meeting room and a relaxation space providing massages. The hotel also offers a shuttle service to the Palais des Festivals and car rental at the 24-hour front desk. This Novotel is just 16 miles from the Nice Côte d'Azur Airport and private indoor parking is free on site. Marineland amusement park and aquarium is a 10 miles drive from the hotel. Hotel Alnea is located in central Cannes, just 500 ft from the Palais des Festivals and the La Croisette beaches. It offers air conditioned accommodations and free Wi-Fi access. Each of the guest rooms is uniquely decorated, including many modern art paintings. They also have a private bathroom and a flat-screen TV. Alnea serves a daily buffet breakfast which can be taken in the guest room upon request. The hotel also offers a dry cleaning service. Cannes Train Station is 800 ft from the hotel and the Old Port is 1300 ft away, providing easy access to the Iles de Lerins and St Tropez. Public parking is available nearby. Located in Cannes city centre, Hotel Abrial is 500 metres from La Croisette and a 15-minute walk from the Palais des Festivals. It offers air-conditioned accommodation with free Wi-Fi. Guest rooms have a private balcony and tea and coffee making facilities. Each room is equipped with a flat-screen TV and satellite channels. Free toiletries and a hairdryer are supplied in the bathrooms. A full breakfast buffet is served daily and guests can relax on the garden terrace. The hotel has a multilingual staff and a 24-hour reception. Private parking is available on site and the hotel is a 25-minute drive from Nice Cote d’Azur Airport. Cannes Train Station is just 700 metres away. Pavillion Bel Air is located in Cannes, half a mile from La Croisette and a 15-minute walk from the Palais des Festivals. It offers contemporary apartment accommodations with free Wi-Fi. The spacious studios and apartments include air conditioning, satellite TV and a balcony or terrace. They also have a fully equipped kitchen with a dishwasher and washing machine, and Nespresso coffeemakers. Public parking is available on site for guests exploring the Cote d’Azur region by car. Cannes Train station is half a mile from Pavillion Bel Air and Nice-Cote d’Azur Airport is 12 miles away. On the famous La Croisette Boulevard in Cannes, Grand Hyatt Cannes Hotel Martinez is a 5-star hotel with a vast private beach. It features a heated outdoor pool, a piano bar and a spa. Guest rooms at Hotel Martinez are decorated in a classic Art Deco style and have a sitting area. Each air-conditioned room features a marble bathroom and some have a private patio with views of the Mediterranean Sea. The Martinez has 3 restaurants, including the award-winning La Palme d’Or with a terrace overlooking the sea. Guests can also enjoy a refreshing cocktail in the hotel piano bar. A continental breakfast is served every morning. A range of beauty treatments and massages are available at L.Raphael Spa and guests can exercise in the fitness center. Hotel Martinez has direct access onto the beach and is within walking distance of the shopping area. With a secure private parking lot, the hotel also has valet parking. Nice-Cote-d’Azur Airport is 12 miles away. This Cannes hotel is located 220 yards from Boulevard de la Croisette. It offers air-conditioned rooms and suites, private grounds, terrace and salon. Free Wi-Fi is available. Hotel Alexandre III’s rooms are soundproofed and combine classical French style with modern facilities. They are equipped with a telephone, satellite TV, and a private bathroom. The beds have an orthopedic mattress. The suites at Alexandre III feature king-size beds with leather headboards and furniture with bronze details. Hotel Alexandre III serves breakfast until noon. It has a salon where guests can enjoy a cup of tea or coffee. The hotel’s private grounds and terrace are ideal for relaxing in the sun. Alexandre III Hotel is 330 yards from the beach and a 20-minute walk from the Palais des Festivals et des Congrès. Guests have access to free parking. Located in central Cannes, the Allees Hotel is a 5-minute walk from the Palais des Festivals and the SNCF train station. It offers soundproofed accommodations with air conditioning and free Wi-Fi. Each room at Des Allees has private bathrooms and satellite TV. Some rooms also have a private balcony with a view of the Old Harbor. A continental breakfast is served daily in the Allees Hotel’s breakfast room. 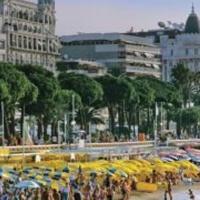 The Allees is less than half a mile from the beaches of Boulevard de la Croisette. It is an ideal base for exploring the French Riviera and Antibes is a 20-minute drive away. Le Floreal is entirely air conditioned and features a flower garden, set 1700 ft from La Croisette and Cannes Beach. It offers free Wi-Fi in the lobby and a sun room and shaded patio. Each of the Floreal’s guest rooms has a private bathroom and a flat-screen TV. Some rooms have a view of the hotel's garden. The hotel restaurant serves traditional French cuisine and a buffet breakfast. Guests of the Floreal can relax with a free newspaper and a drink from the bar on the hotel terrace or on the grounds. Le Floreal also offers a game room and library. Guests can enjoy numerous other activities and water sports at the nearby beaches, including water skiing and diving. Built in 1911, the InterContinental overlooks the bay on the Boulevard Croisette and features its own private beach, pier and Belle Epoque façade. It is half a mile from the Palais des Festivals, in central Cannes. The InterContinental Carlton Cannes offers air-conditioned guest rooms with satellite TV, video games and luxury bedding. The elegant rooms overlook central Cannes or offer panoramic views of the bay. The Carlton beach restaurant is open during summer and another traditional restaurant is also available on site. Guests can also enjoy a drink in one of the 2 bars. The Carlton’s staff is available 24 hours to assist with car rental and beauty treatments. A fully equipped Carlton Fitness Centre is provided exclusively for guests' use. The InterContinental Carlton Cannes is just a 25 minute drive from Nice Côte d’Azur Airport and 5 minutes from Cannes train station. On Boulevard de la Croisette in Cannes, the JW Marriott Cannes is just 165 ft from the beach. This 5-star hotel showcases a rooftop swimming pool, a casino and a shopping gallery. Accommodations at JW Marriott Cannes blend shades of cream and chocolate with a Film Festival-theme. Each has an LCD satellite TV and some rooms have a balcony with views of the bay and the Lerins Islands. An American-style buffet breakfast is served every morning. Guests can enjoy a steak at the JW Grill Restaurant. In the evening, the hotel’s rooftop bar Le Panorama has aperitifs. Room service is available daily and there is a limited menu overnight. Other facilities at JW Marriott Cannes include a rooftop hot tub with lounge chairs and showers. There is also a 24-hour front desk with a currency exchange service and a business center with Wi-Fi access. JW Marriott Cannes is 19 miles from Nice-Côte d'Azur Airport and a 15-minute boat ride from Sainte-Marguerite Island. Private underground parking is available on site. Hotel Vendome is in a 19th-century villa with private grounds 650 ft from Rue d’Antibes. It offers air conditioned accommodation, a terrace and 24-hour reception in the center of Cannes. Rooms at Hotel Vendome are soundproofed and equipped with a telephone, satellite TV and a private bathroom. Some rooms have a view of the hotel’s private grounds. Vendome serves breakfast every day, and guests may eat in either the dining room or in their room. The hotel also has a bar that provides cold, non-alcoholic drinks. Guests are invited to relax on the terrace. Vendome Hotel is a 5-minute walk from the Promenade de la Croisette and the Palais des Festivals et des Congrès. The Cannes Train Station is 1700 ft away. Free on-site parking is available. Located 250 metres from Cannes Train Station, this ibis Hotel is a 5-minute walk from La Croisette Beach and the Palais des Festivals. It offers air-conditioned accommodation with free Wi-Fi. Each guest room at the Hotel ibis Cannes Centre is air-conditioned and has a flat-screen TV with satellite channels, safety deposit box and a radio. Rooms are also serviced by a lift and have a private bathroom. Guests are invited to relax in the Cannes Centre’s 24-hour bar, which serves snack food. Covered private parking is possible on site, upon reservation and at an extra cost. The ibis Cannes Centre Hotel is situated behind the Rue d’Antibes, in the heart of Cannes shopping district. Nice Airport is 25 km away. Hotel Montaigne & Spa is located just a 5-minute walk from La Croisette and the beaches in the center of Cannes. Guests have access to the 2691 ft² spa with a hammam, indoor swimming pool, hot tub and beauty treatments. The contemporary guest rooms include air conditioning, a flat-screen HD TV with satellite channels and free wired and Wi-Fi internet access. The hotel's restaurant serves light, traditional cuisine throughout the year. Each evening guests can also enjoy an aperitif on the hotel’s decked terrace. In addition to a 24-hour front desk, Hôtel Montaigne & Spa also provides a dry cleaning service. Hôtel Montaigne & Spa is only a 3-minute walk from Cannes Train Station and just over a quarter mile from the Palais Des Festivals. Private on-site parking in garages is possible and subject to availability. Villa Garbo is a 5-minute walk from the beach and the Promenade de la Croisette. It offers suites, a lounge bar and spa near Rue d’Antibes. Free Wi-Fi is available. Villa Garbo’s spacious suites are equipped with a flat-screen TV. Some have a BOSE home cinema and an IPOD docking station. Each suite has a kitchen with Sarreguemines china and a Nespresso coffee machine. The private bathrooms feature gray granite details. Every evening, Villa Garbo’s Lounge Bar invites guests to enjoy complimentary drinks by the fireplace during winter or on the terrace during summer. Guests can have breakfast in the privacy of their suite or in the lounge. Garbo’s spa includes a fitness room with high-tech equipment and a hammam. The spa provides massages, on appointment, using Anne Semonin products. Villa d’Estelle provides luxury apartments and suites in the heart of Cannes, just 50 metres from La Croisette and beaches. It has a terrace with a pool and solarium. The contemporary air-conditioned accommodation includes free Wi-Fi access, a fully-equipped kitchen and a terrace or balcony with views of La Croisette. The Palais des Festivals is 200 metres from the residence and the ferry port is a 5-minute walk away, providing access to the nearby Mediterranean islands of Ile les Lérins. Hotel Pruly is in Cannes, a 5-minute walk from the beach. It has a garden and terrace with lounge chairs. Each guest room has soundproof windows, air conditioning and free internet. All of the soundproof rooms have a private bathroom, an LCD TV with international channels and Canal+, and free Wi-Fi internet access. A continental breakfast with coffee is served every morning in the breakfast room. Hotel Pruly is a 5-minute walk from La Croisette and an 8-minute walk from the Palais des Festivals. Cannes Train Station is just a quarter mile from the hotel. Hotel Beau Séjour offers air conditioned accommodations, a lounge bar and a landscaped grounds with an outdoor swimming pool. It is less than half a mile from Mediterranean beaches and a 12-minute walk from the Palais des Festivals. Satellite TV and a private bathroom are available in each guest room at Hotel Beau Sejour. Each room has a terrace or balcony and is serviced by an elevator. A buffet breakfast is served daily. Guests can enjoy a light lunch in Beau Séjour’s lounge bar or on the terrace overlooking the grounds and pool. The bar also serves a variety of cocktails and hot drinks. Beau Séjour’s spa offers a variety of treatments and facilities including a hammam, massage and Finnish sauna. Beau Séjour Hotel is half a mile from sandy swimming beaches at Plage du Midi. Cannes-Ville Train Station is one mile from the hotel and Cannes-Mandelieu Airport is 3 miles away. Car rental can be arranged at the hotel. Hotel Albert 1er is located a 10-minute walk from the Palais des Festivals et des Congrès and the Croisette Beach. It offers air-conditioned rooms, a terrace and free Wi-Fi. Rooms at the Albert 1er are equipped with a telephone, satellite TV and a private bathroom with bathtub or shower. All of the rooms overlook the sea and Lerins Islands or the hills of Cannes. Albert 1er Hotel serves breakfast daily that guests can have on the terrace. There are a number of restaurants nearby. Albert 1er is half a mile from the Cannes Train Station and is accessible from highway A8. Guests have access to free parking. Eden Palace is located in Cannes, a 5-minute walk from Cannes Beach and La Croisette. It offers air-conditioned 4-star studios and apartments, each with a balcony and an equipped kitchen. Each of the Riviera Eden Palace’s guest rooms is soundproofed and has a private bathroom and TV. Each kitchen has electric hotplates, a fridge and microwave. The Eden Palace serves a buffet breakfast in the mornings and the hotel staff will be happy to recommend a nearby restaurant. Guests can visit the numerous boutique stores along Rue d’Antibes, situated next to the Riviera Eden Palace. Highway A8 is a 10-minute drive from the hotel and private parking is available. Hotel Le Florian is located in central Cannes, just 220 yards from La Croisette beaches and Rue d’Antibes. It offers soundproofed rooms and apartments with free Wi-Fi internet access. Guest rooms at Le Florian are air conditioned and have a flat-screen TV and a private bathroom. The apartments have a kitchenette equipped with a microwave, hotplate and tea/coffee maker. A continental breakfast is served daily. Le Florian Hotel also provides a 24-hour front desk and the staff can offer local tourist information. The Palais des Festivals is 680 yards from Le Florian and Cannes Train Station is 550 yards away. In the heart of Cannes, Hotel Amiraute is 165 ft from the La Croisette with its luxury shopping and sandy beaches. It offers soundproofed rooms with free Wi-Fi access. Each modern room comes with a flat-screen TV with cable channels, a minibar and a private bathroom with hairdryer. Some rooms have a private balcony. A continental breakfast is served every morning in Hotel Amirautein's breakfast room or breakfast can be enjoyed in guests' rooms. There is a 24-hour front desk. Cannes Train Station is just 300 ft from the Amiraute, and Le Croisette Barrière Casino is a 5-minute walk away. There is a public parking lot 65 ft from the hotel. Sun Riviera is in central Cannes, a few minutes’ walk from Boulevard de la Croisette. It offers an outdoor swimming pool, an outdoor terrace and a Mediterranean garden. The train station is a 10 minute walk away. Guest rooms at this 4-star hotel are air-conditioned and soundproof. Each has a marble private bathroom, flat-screen satellite TV and Wi-Fi internet access. Guests can enjoy a drink in the bar at hotel Sun Riviera. The hotel also has a spa area, which offers a range of beauty and massage treatments. The hotel is a short walk from the Palais de Festivals, the Convention Centers and the many shopping opportunities and restaurants on La Croisette. A private garage is available on site. Le Canberra is on Rue d’Antibes in central Cannes, a 5-minute walk from the beach. It has a heated outdoor pool surrounded by a sunbathing terrace and a Mediterranean garden. Each of the Canberra’s guest rooms and suites has air conditioning, soundproof windows and an LCD satellite TV. They all also have a private bathroom and free Wi-Fi access. The Canberra’s restaurant, Le Café Blanc, serves traditional Mediterranean cuisine and opens onto a large terrace overlooking the pool. Guests can dine and enjoy drinks on the patio and terrace. Guests at the Hôtel Le Canberra have access to a fitness room with a sauna. The front desk is open 24 hours for guests’ convenience. The Palais des Festivals and La Croisette are within easy walking distance of the Hôtel Le Canberra. Guests can also visit the many boutique shops surrounding the hotel. Hotel Victoria offers air conditioned accommodations just 55 yards from Rue d’Antibes and 330 yards from Promenade de la Croisette. It has a lounge bar, swimming pool and a 24-hour front desk. Rooms at Hotel Victoria are soundproofed and overlook the pool, grounds or Rue d’Antibes. Each room is accessible with elevator and equipped with a telephone, cable TV and private bathroom. Some of the rooms have a balcony. Victoria Hotel serves a buffet breakfast in the lounge or next to the pool. Guests can also have breakfast in their room. Victoria’s bar provides a variety of cocktails that guests can enjoy by the outdoor pool. Palais des Festivals et des Congrès and Cannes’s train station are a 10-minute walk from Hotel Victoria. This Citadines Apart’hotel is in central Cannes, a 10-minute walk from the Palais des Festivals and La Croisette beaches. It has a rooftop terrace with a deck. The air-conditioned studios and apartments include free wired internet access and satellite TV. They feature a living area and a kitchenette equipped with an oven, hotplates and refrigerator. Guests of the Citadines Apart'hotel Cannes Croisette have access to a private beach during summer months. The residence also provides a laundromat and dry cleaning services. The property is a 5-minute walk from Cannes Train Station and a 10-minute walk from the old harbor. With on-site parking, the Citadines is on Boulevard Carnot, which provides direct access to the E80/A8 highway. The Hôtel Colette is in the heart of Cannes’ shopping area, and a 5-minute walk from the famous La Croisette beach. It features air-conditioned guest rooms with Satellite TV. Each soundproof guest room at the Hôtel Colette has a contemporary design and comes equipped with high speed Wi-Fi access and a minibar. All rooms have a private bathroom with l'Occitane welcome products. Guests can choose between an breakfast and a buffet breakfast every morning, served on the hotel’s terrace. There are a number of restaurants and bars near the hotel. Hôtel Colette is a 5-minute walk from the Palais des Festivals et des Congrès where the Cannes Film Festival takes place each year. It is easily accessible from the A8 highway and Cannes Train Station is across from the property. Guests receive special rates at a nearby parking lot.